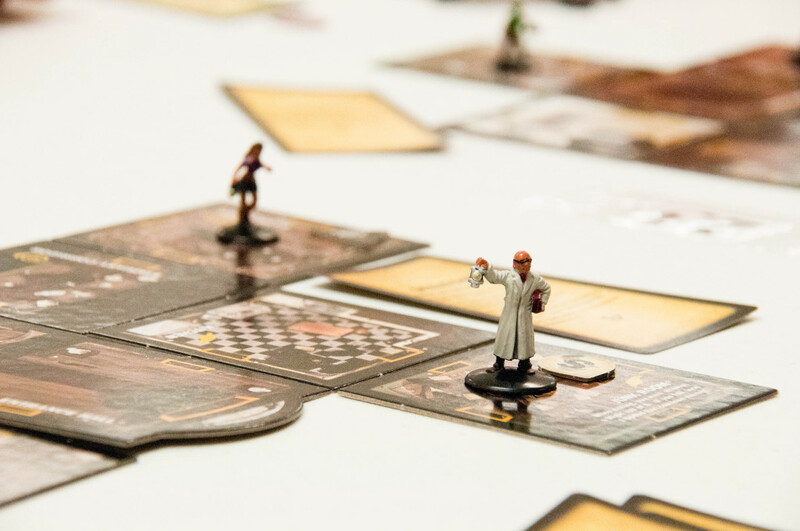 Fans of horror movies and creepy games will be psyched; the board game Betrayal at House on the Hill forces 3-6 players into their very own horror story as they layout a haunted house, with three levels, exploring each room for items, events, and omens. They must be able to pass frequent tests of physical and mental abilities with scary experiences waiting around every corner. And just when you think that there may be some light at the end of the creaky hallway, the Haunt begins and reveals one of the unsuspecting characters to be a traitor…. that’s when things get even scarier… The heroes are given certain objectives that they must complete in order to win, which do not coincide with the traitor’s new, threatening plan of action. Who will survive your terrifying adventure?!? Right from the start, this creeped us out…. 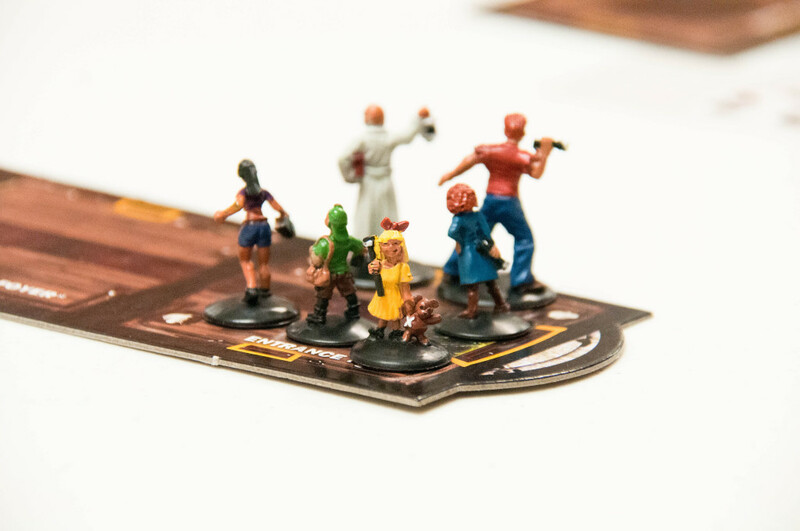 my character was a little girl in a yellow dress with a big red bow in her hair, a larger-than-life flashlight in one hand, a teddy bear dragging from the other. She doesn’t look sinister at all with that pasted on smile…! We immediately took to exploring the house. 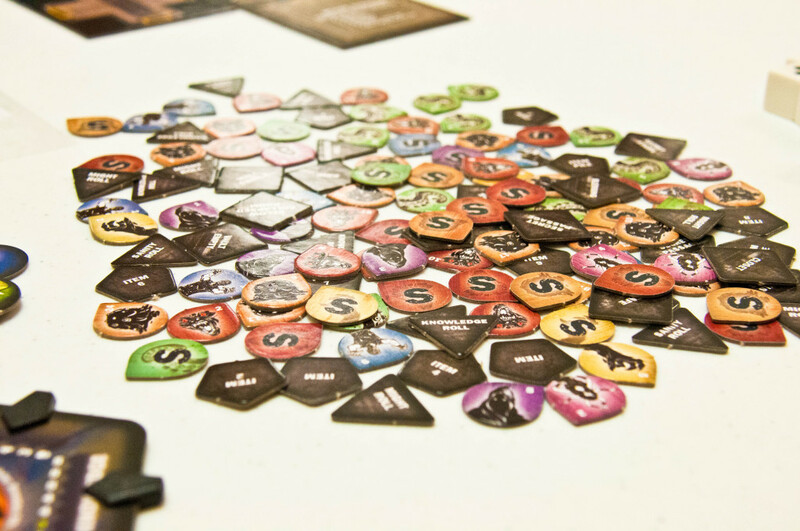 Each player has the option of moving up to the number of his/her Might on the character’s card. If my might is 4, then I may move up to 4 spaces. As soon as I walk through a doorway, essentially into nothingness, I am exploring/adding a new room to the house. A random room is drawn from the deck with the appropriate floor listed on it (upper floor, ground floor, or basement), depending on where I happen to be exploring, and added to the existing house. Room tiles have symbols on them; some trigger events, others provide items, and still others prompt omens to be revealed. The events typically cause your character to test their physical and/or mental traits. The item cards seem like they are few and far between, but they are beneficial, and all the more precious, when you get your hands on one. The omen cards can be good or bad for the character who revealed them, but at the end of the turn, they force the character to make a Haunt Roll to see if the Haunt begins. What is the Haunt??? It is the spine-chilling plot twist, where by the game determines which of the characters unwittingly turns traitor against his comrades. The haunt begins when the dice roll is less than or equal to the number of omens currently revealed. The Traitor’s Tome has a Haunt Chart that cross references the last room that a character was in when the Haunt began with the omen that triggered the Haunt. The tome gives a number for which haunt will be played this game, as well as which character has become the traitor. Cards like this, Amulet of the Ages, made us hopeful that we could, in fact, come out of this horror story successful AND alive! The unfortunate dice rolling, and the continued drawing of event cards, were what made the situation seem more realistic and desperate. Added to that, the traitor was now doing everything in his power to accomplish his own goals and thwart our plans. The heroes had a pretty solid plan in place with characters, who excelled in knowledge and sanity, attempting to diffuse the bomb, and the other characters, who excelled in might and speed, protecting the rescue and running for the front door. We were all spread out and doing what we do best, which provided for a swift victory! WHEW!!! One fateful foray into the house on the hill was not enough to satisfy these terror-loving fans though…. 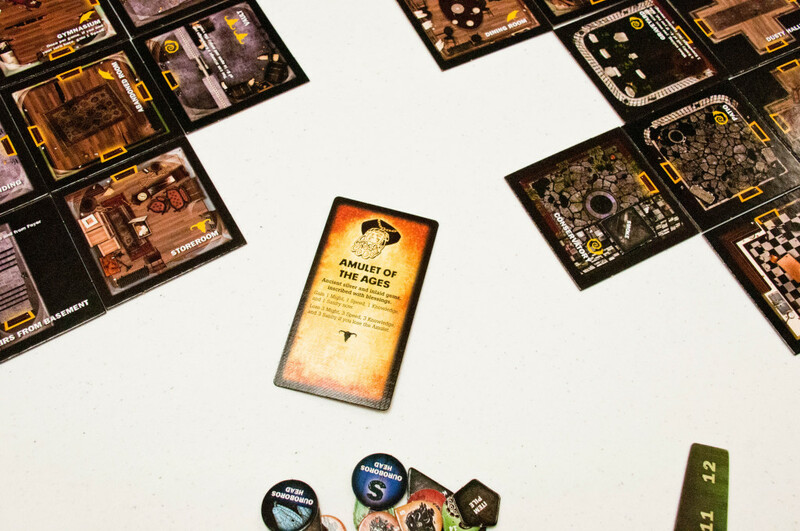 And, so, we continued on, fearlessly into the house… Once the haunt was revealed, we couldn’t believe that the same player was named as the traitor AGAIN! Peter Akimoto (Gregg) took his Traitor’s Tome and slinked off to the corner to plot his revenge since the heroes did win the first game. The rest of us huddled together, yet again, and read from the Secrets of Survival guidebook. This haunt was definitely more complex than the first one we had played. We had to summon a ghost, find the corpse, and bury his bones. Each of these steps required that our characters be in specific rooms to accomplish them. One of the steps was contingent on a time limit. All madness broke loose! Our mission would change once more and we would have to kill the ghost. Too bad the little boy, Peter was uber protective of his ghost friend, and was viciously attacking the heroes. He was kicking shins and running off giggling like he had escaped from a Kindergarten class at the insane asylum. It got a little awkward when the adult heroes had to defend themselves against “the boy”, as said with a Hank Hill, from King of the Hill, accent of sorts. We were out to kill the ghost OR kill the boy, whatever it came down to. It was just too bad that after each hero’s turn, one room in the house collapsed. We lost Vivian Lopez (Sam) after she was brutally attacked by the boy. We lost access to the upper floor and the Pentagram Chamber, as well as Darrin “Flash” Williams (Jason G.), when the upper landing collapsed. We were all doomed at that point. The psychotic boy and his angry ghost friend won the game. 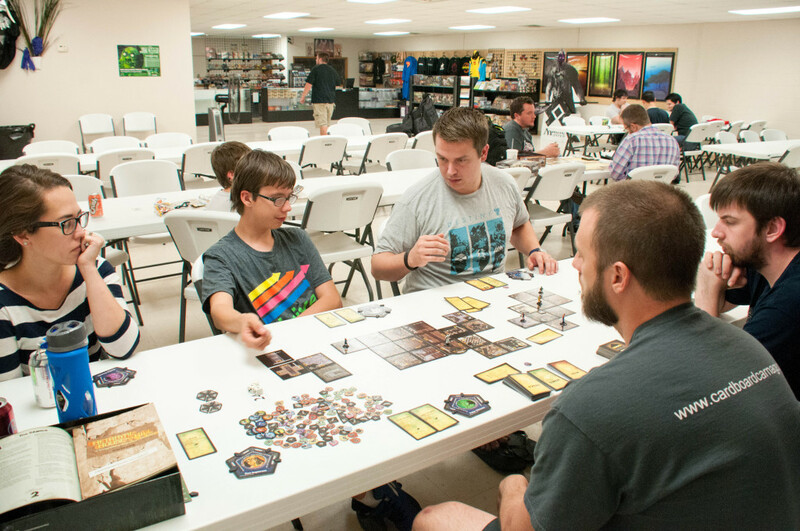 This game was so much fun to play with a larger group of people! We were able to explore more of the house and use team work more effectively once the haunts were revealed. During the game, we highly encourage everyone to read the text on their cards out loud because it is dripping with terror, horror, and ambience. We also think that it would be awesome to play this game in the dark, with a few candles lit, or only flashlights on hand, perhaps some sound effect playing in the background, like we’ve some of the gaming groups play it! 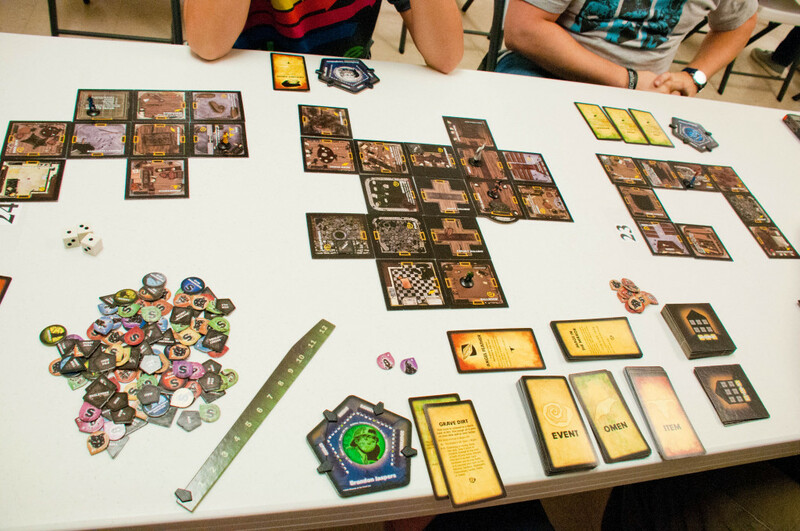 Side note: one of my very favorite things about teaching other people how to play new games, is when I get to witness someone getting thoroughly caught up in it, watch them respond positively, and hear them exclaim things like, “I love this game!” “This game is great!” Betrayal elicited such responses, and I was thrilled! 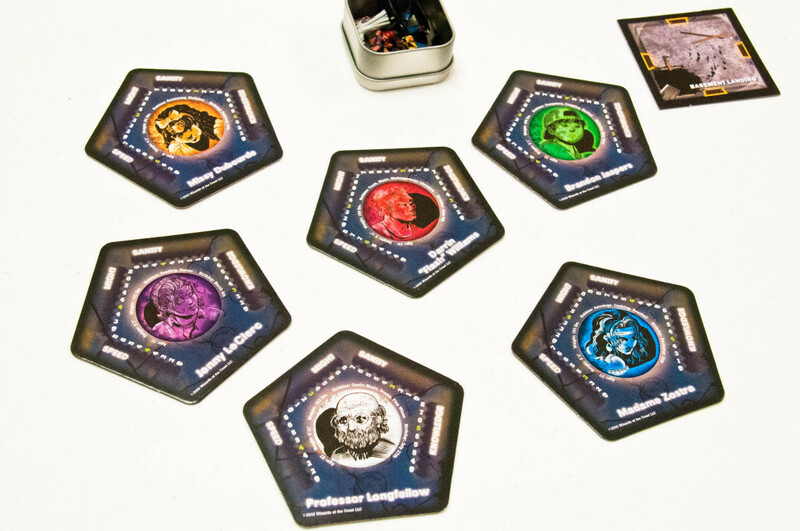 Board games can teach us how to strategize, work as a team, use our imaginations, think outside of the box, and many other things; add a little fear into the mix with a horror-themed board game, like Betrayal at House on the Hill, and you get all of the above PLUS maniacal laughter, evil plotting, group sighs of relief, and rage fists on the table every time an omen makes an appearance!